Saab has tried to create a renaissance of sorts. The company was sold to Netherlands specialty carmaker Spyker last year. Spyker took an awful risk, particularly in the U.S. -- because Saab is one of the few car firms that did recover when the U.S. car market expanded last year. The total number of cars and light vehicles sold in America in 2010 was up 11% to 11.6 million. Sales of some niche brands surged. Porsche sales in the U.S. were up 29% to over 29,000. Audi sales rose 22% to over 101,000. But Saab sales collapsed -- falling 37% to 5,445. American car companies have also created new lines of vehicles that have begun to sell well, particularly in the middle market where Saab operates. The Japanese still control the lower-price, high-quality portion of the market. And Korea's Hyundai took share from nearly everyone else last year, as its sales rose over 24% to just above 538,000. There's no room in the American market for tiny operator like Saab. The company is running third in a three-horse race with Office Max and Staples. Office Depot also has to compete with small business centers in Sam's Clubs and Costcos. The firm operates on razor-thin margins, while managing 1,150 locations -- which are very costly due to employee and real estate expenses. 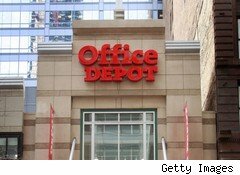 Office Depot is a strong candidate to be taken over by one of its rivals or a broader retail chain like Target. The maker of dairy products like Land O'Lakes and Silk has struggled as much as any other large public company this year. The costs of raw milk, butterfat, soybeans and sugar have risen sharply. Dean Foods has also been crippled by debt. The firm's shares were down as much as 60% at one point during the last 12 months. The carrier is owned by Republic Airways Holdings and was bankrupt when Republic bought it in 2009. Republic recently merged another of its holdings, Midwest Air, into Frontier. Denver-based Frontier is simply too small to compete in the domestic carrier market -- which has become increasingly dominated by large airlines that are growing due to mergers. Wall Street has also become increasingly worried about Republic's future. Its shares are down 13% over the last quarter, while shares in rival JetBlue are up 9% during the same time frame. Frontier's Milwaukee hub, which serves the East and Midwest, and its Denver hub, which serves the West, the South, and Mexico, would be valuable to a larger carrier. Airline mergers and buyouts like the Continental/United deal and Delta's takeover of Northwest are popular in the industry because they allow for personnel reductions and route cuts -- as well as trimming the number of aircraft that have to be maintained. Two airlines together can have a better margin than separately. Frontier is a buyout target; its brand is not. The company that makes Ball Park hot dogs and Jimmy Dean breakfast foods is already being circled by corporations in similar businesses and by private equity firms -- groups interested in breaking Sara Lee up. Apollo Global Management has recently considered a bid. JBS, the Brazilian meat processor, made an offer that was turned down. The large bookstore chain is almost gone already. The only question remaining is whether it will be dissolved or sold to a related retailer like Barnes & Noble. It appears Borders has little choice other than to go bankrupt, given its debt and cash-flow situation. Two ominous signs for the bookseller: It says it's unable to pay some of its largest publishers for their books. Border's stock also dropped under $1 a share, a warning sign that the shares could eventually be delisted -- that is, if Borders lasts long enough. The company's 500 locations may have value to a buyer, but its name does not, being associated with little more than failure. Acer, meanwhile, has become an established brand in the U.S. over the last two years, particularly for its netbooks and notebooks -- while the Gateway brand has faded. Gateway is still a stand-alone corporation but will likely disappear this year. Dollar Thrifty has a tentative deal to be bought by Avis Budget -- but the FTC has not given the transaction final approval. If the buyout closes, then the Avis, Budget, Dollar and Thrifty car rental businesses will all be under one roof. Dollar Thrifty has lost any momentum in its efforts to expand. The company said in December that it would add 31 new franchises in the U.S. It has 1,550 locations in 81 countries worldwide. The online search firm's stock is down 40% in five years. Google, in comparison was up nearly 40% during that period. The smaller company had third-quarter revenue of only $4.5 million, which means it barely has a reason to be a public company. Operating income for the quarter was only $379,000, and its total average page views daily are about 14 million. Answers will likely be sold to a company that could use its technology platform and unique visitor traffic. This might include one of the portals or large online content companies like News Corp. The company's market value is only $65 million, which is pocket change for a really large Web company. There are too many big discount brokers in the U.S. There have been persistent rumors that E*Trade will be bought by one of its larger competitors --Charles Schwab or TDAmeritrade. The rumors even caused a large move in E*Trade's options early last month. Broker Collins Stewart downgraded E*Trade shares recently, pointing to problems with loan portfolio growth on the banking side of the online brokerage's business. Wall Street's view of the other two discounters is much more positive. The brokerage business has been ideal for consolidation for years. Full-service brokers went through a large number of mergers and acquisitions in the 1970s, 80s and 90s. The reason for the rollups were compelling then as they are now for E*Trade. There are a number of expensive duplicate functions among these companies -- which include marketing costs, trading platforms and administration. Either Schwab or TDAmeritrade will use those economies of scale to buy E*Trade, the weakest member of the sector.